Behind dogs and cats, bunnies are the third most popular animal in the US pet industry. This also means they are the third most abandoned. It’s hard to quantify the exact number of bunnies that are abandoned annually, but The Huffington Post claims a whopping 80% of the ones up for adoption in shelters were once purchased for Easter gifts. Contrary to popular belief, bunnies and children do not mix well. Kids have a natural instinct to pick up and cuddle their furry new friends, while bunnies are ground dwellers and are not naturally comfortable being carried around. They scare easily and it takes a very special companion human with a lot of time and patience to build trust before they will reveal their subtle personalities and warm up to snuggles. Many people have little knowledge of rabbits to begin with and some, when surveyed, believed that their life expectancy is only 1-2 years. In reality, when properly cared for, bunnies can live 10-12 years and deserve to be in environments where they can do just that. Until animals are protected under the law, the lives of these precious creatures rest in the hands of humans, who in most cases are ignorant to the full extent of care and needs that bunnies actually require. 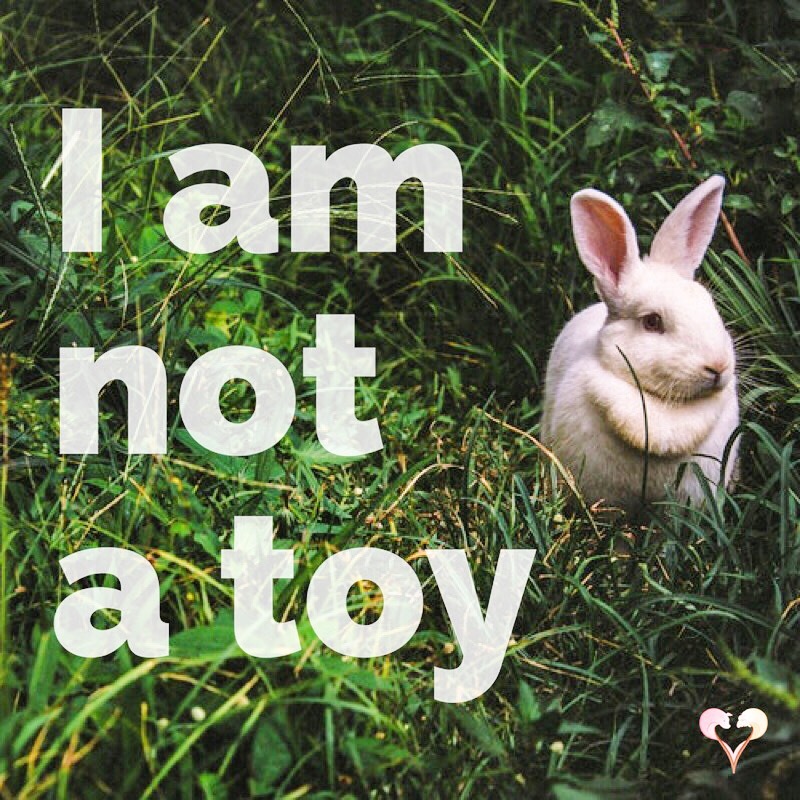 They are not toys and although it is legal to do so, they should NOT be distributed as inanimate objects to pass around and play with, to ultimately have a child disappointed in the bunny’s lack of interest and eventually grow bored of them. Please educate your friends and family on the responsibility and commitment required to care for a bunny and that Easter is not a good enough reason to adopt a bunny unless you fully intend to invest in them for the course of their lifetime. Shelters don’t have the space or the funds to manage all of the abandoned bunnies who are disposed of after Easter. The worse alternative is being unwanted to then be dumped outside (a death sentence for domesticated bunnies who haven’t acquired the proper survival skills) all due to humans making impulsive and irresponsible choices. Older Post$1225 Raised at Vegan Street Fair!